1. To make the dressing, combine the tamarind paste with the sugar, lime juice and fish sauce. 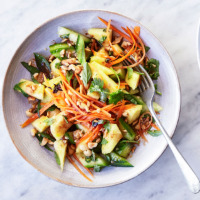 Toss through the pineapple, cucumber, carrot and herbs. Set 1 heaped tbsp crushed peanuts aside and toss the remainder through the salad with the dressing. Scatter with the reserved peanuts to serve, adding more fish sauce to taste, if liked.